I have this ongoing love-and-hate conflict with shoulder holsters for concealment and even open-style carry. Allow me to explain. Since I was a kid I’ve watched TV and movie cops wearing shoulder holsters, and as a kid I always thought it looked cool. As it turns out, that’s about the only reason TV cops wore shoulder holsters: to look cool. While on film the shoulder holster, and more importantly the cool gun in it, were in perfect camera view. So with all this in mind once I became a cop in the late 1970’s I carried a Walther PPK as a backup gun to my large 357 revolver. Naturally I went looking for a Berns Martin Triple-Draw, (or sometimes referred to as a Lightnin’) shoulder holster just like James Bond wore in the movies. Bond gun, Bond holster, right? This style actually held the gun upside down with the muzzle aimed towards your armpit. 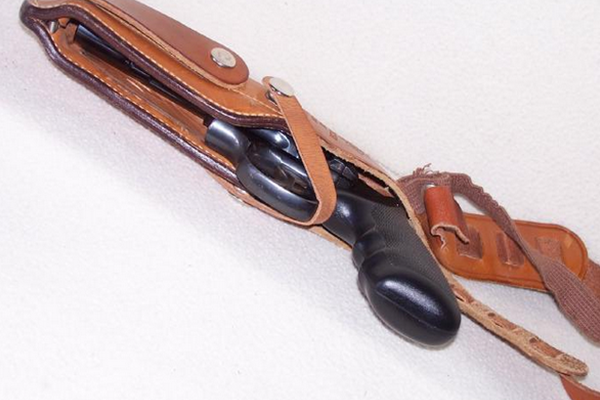 It secured the gun with a metal clip wrapped in the edge of the leather. I guess Firearms Safety Rule 2 was not yet fully accepted. I found out that particular holster was manufactured only for revolvers and was never made for either of Bond’s guns, the PPK or Browning 25. Oh, and that (rather disappointingly) Ian Fleming often wrote about specific equipment in his novels by name brand only because he liked the sound of it. But undeterred I found a replica made by a company called Astra Leather Company for my S&W J Frame snubbie (Model 37) in .38 Special. It didn’t fit the gun right so I sent it back for a refund and never saw the holster or my money again. That was 1979, so if you know where these people are today let me know. About that time I was in a store with a huge holster wall display and found a Bianchi X15. No mail order being a plus, I bought one right then. It was just like what Dirty Harry and a thousand other fictional cops wore. This holster carried the gun vertically along your support side from your arm pit to your hip and had a strap to secure it to your belt. The muzzle thankfully pointed downward this time. It had a removable safety strap that went across the trigger guard to lock the revolver in. If memory serves, it actually extended about a half inch or so below my belt. It was well made, beautifully finished in a rich tan color, and fit the Smith and Wesson Model 19 I carried perfectly. It had a leather loop for your support side shoulder and an adjustable elastic loop that went across your back and around your strong side shoulder. Another elastic strap then went down to your strong side hip to snap around your belt to help offset the weight of the gun on the other side of your body. But that was the end of my love for shoulder holsters. After several weeks of trying it out and wearing it under a jacket off-duty, I was walking around hunchbacked with a sore neck and shoulders. It was, over almost any reasonable amount of wear time, ultimately uncomfortable. I adjusted it up, down, tighter, and looser; all to no avail. Soon it was a nice conversation piece on my coffee table in my bachelor pad. Everybody wanted to try it on. I think it was well designed but with the heavy guns of the day a good hip holster was easier to manage, so I wore one of those. What I didn’t quite get back then, but understand now, was the real reason I probably shouldn’t have worn a shoulder holster at all. More on that point later. My next attempt was in the mid 80’s and Sonny Crocket on the hit show Miami Vice had that Jackass Leather Company rig (now renamed Galco – thank goodness) horizontal shoulder holster, aptly named the “Original Jackass Rig” and later the “Miami Classic.” Mondo cool. Who didn’t want to look like Don? 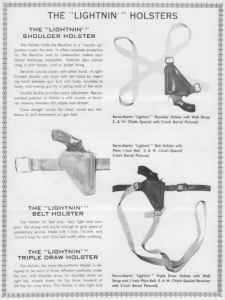 This was a revolutionary design that has become one of the most copied shoulder holsters in history. It is the only one I would even consider nowadays. It is actually a system with the harness being a leather X that crosses your back and loops around both shoulders equally with sturdy leather. All adjustable. 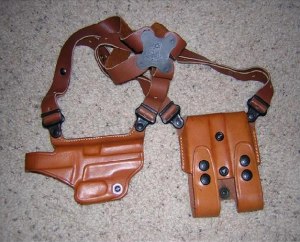 The holster part you can buy separately so one rig can be adapted to many different guns from revolvers to semi-autos. On the off strong side) you can place a strap to your belt, a handcuff case, a magazine or speedloader pouch, or even a knife/flashlight case. Overall it is a better and more comfortable design. I still have one for my 1911’s and for a Glock. But I shouldn’t have loved them. None of them. Not for why I was wanting a shoulder holster anyway. I wanted the casually cool and easy convenient style of wearing my gun. The ability to wear the higher waist-length jackets (Members Only) that were popular. I wanted the ability to throw on and off a full rig including gun, reload, and knife or light with the ease one pulls on or off a jacket. It was later in my police and military career that tactics evolved to counter threats that had grown more sophisticated and violent. It was how and why I learned wearing a shoulder holster of any pedigree had to be only for special job requirements. You see, it was in the unique draw stroke a shoulder holster required that I figured out my folly. 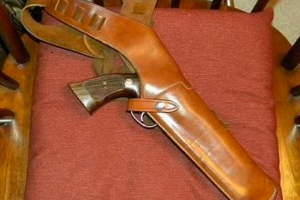 A shoulder holster requires a special technique to draw the gun efficiently. It involves reaching with your primary weapon hand and arm across your chest to grip the gun in the holster, while pinching the holster against your support side armpit with your support side bicep. This means a couple of things. First, your primary weapon arm and hand are out of position should your adversary close in and grab you or just mash their body against you. You are off balance and your strongest arm is awkwardly positioned and out of play. Second, your support side arm in order to counter this must be out of its assigned place on your body (as in a proper Four Point Draw) and out in front of your chest. This means if you can even get the gun out – it may be pointing at your own hand and arm. Assuming you don’t have this scenario and the area is reasonably clear, without strict attention and practice when drawing from a shoulder holster you almost always wind up pointing the muzzle at things behind and beside you that are not looking at, and people or things you probably shouldn’t shoot. Not the least of which is yourself! In training session after training session combatives experts can foil or prevent your draw from a shoulder holster with boring repetition and ease. Whereas with a hip or inside the waistband (IWB) style holster on your primary side you can draw and angle the gun and holster away from a close-in attack by blocking with your support side shoulder and arm. So, unemotionally, is there a real world non-TV cop oriented rationale behind employing a shoulder holster? Well of course lawful handgun hunting comes to mind, but most of those rigs are actually chest drawn, worn on the outside of your hunting coat and not under it. The same safety warning applies though, watch where the muzzle is pointing as you draw. I mentioned above there were special job requirements that could justify shoulder holsters. Missions such as a protective service driver. Shoulder holsters may be difficult to draw correctly and safely while standing, but while seated in a car with a seat belt on, they are considerably easier to get into play than a hip holster. For the exact reasons I think they border on unsafe when drawing from a standing position – muzzle pointing at things behind and beside you during the draw – they give a seated driver an advantage. Assuming I’m a protective driver in a parked car and an adversary approaches the window. Say I can’t hit the gas and drive off (preferred method) so I have to engage. As I grab my gun in the shoulder holster and start my draw, I throw my support arm up over my head and voila! I am pointing the muzzle towards the threat! This can work and is used every day around the world by PSO’s and PSD’s, but must be trained and practiced. Please remember I advocated just driving off. Another scenario that is a similar job for a shoulder holster would be a seated dispatcher or some kind of assigned desk duty. Maybe a temporary medical condition that prohibited carrying my gun on my hip. If you consider a shoulder holster as your everyday carry (EDC) concealment method remember the natural disadvantages and train the technique of the draw to best mitigate those risks.